When creative director, choreographer, and Arts Umbrella alumna Jess Dexter asked if any used items could be donated to young dancers in Cuba, the answer was ‘Yes!’. “Quite often people drop things off at our office, saying my child has outgrown all of this. If there is another child in need please give this to them,” says Tracy Wiens, a coordinator with Arts Umbrella who helped collect ballet and jazz shoes. 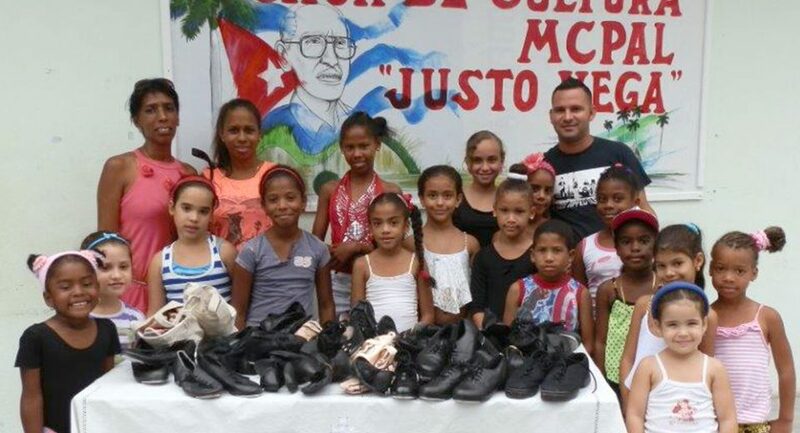 Knowing that young dancers in Cuba didn’t have access to shoes inspired the community-minded artist. “When I found out we were going to be stopping at a performing arts community centre and that there were children dancers, I thought we could bring some gifts,” says Jess, who was traveling on a cultural exchange with the choir Roots N’ Wings. “Dance shoes would be unattainably expensive in Cuba. I am a dancer, teacher and choreographer, and a privileged one at that…therefore I try to give back as much as possible to less fortunate dancers,” says the teacher who also contributes to the creative community through Jess Dance, a company of dance teachers that creates programs for schools in British Columbia. From teaching to traveling to organizing donations, Jess is one example of the many inspiring artists who are having an impact on our community – both on a local and international scale. And the highlight for Arts Umbrella’s programming team? Seeing the smiling faces of the little ones who will now be dancing in those shoes.